The Invacare® Tracer EX2® Deluxe Wheelchair is a full featured manual wheelchair featuring swing away footrests and removable arms at an affordable price. The Invacare® Tracer EX2® Deluxe Wheelchair ships for free (including the optional accessories) to the lower 48 States. If you are in Alaska or Hawaii, please contact us during business hours so we give you a price for shipping. The Tracer EX2 Deluxe Wheelchair is available with either a desk length or full length armrest side panel. Both armrest side panels are removable for easier entry and exit. The height of each length is fixed (non-adjustable). The full length armrest side panel features an armrest pad approximately 14 inches long. A longer armrest pad is may be more comfortable for some users. 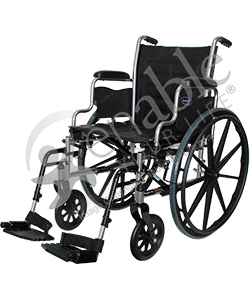 The Tracer EX2 Deluxe Wheelchair can be had with either standard footrests or elevating legrests. For most users, the choice depends on doctor advice and recommendation. Both options swing out of the way (without removing) allowing for easier entry and exit. In addition to the armrest and footrest options, you can choose from the following optional accessories for your Tracer EX2® wheelchair. Comments: A really strong, attractive, & very useful wheelchair for an unbelievably low price. If you need a good deal wheel because of leg problems, this is it! An added advantage is that it''s ruggedness gives you a mechanism for exercising your upper muscles that need to be kept stronga 2-in - 1 deal!